Summary: In this article, Lytle observes that teacher-researchers aim primarily to teach better, a theme she finds illuminated in Atul Gawande’s Better: A Surgeon’s Notes on Performance, a physician-written book about the practice of medicine. She discusses why it makes a difference to ask those who work in a particular setting, whether medicine or education, to study and develop solutions to problems within that setting. Thought-provoking background reading on the importance of teacher inquiry, this resource may be useful for study groups or in workshops focused on beginning the inquiry process, and could serve as a valuable reading for anyone who must advocate for teachers to have a role in school reform. In Gawande’s exploration of ingenuity, I find myself confronted with examples with direct relevance and evidence for the centrality of practice-based learning, but also with some knotty and persistent questions about how standards, scripted curriculum, and other policies designed to be comprehensive can also respect and honor the local context. Gawande here confronts issues of standardization of practice (how to make childbirth researchable through a common assessment), of measurement of performance (figuring out what to measure), and the ways to link demonstrated success to particulars of different contexts (figuring out what makes one cystic fibrosis center’s performance consistently successful and at the same time a site of continuous improvement). He points out that most medical researchers believe the profession advances through “evidence-based medicine—the idea that nothing ought to be introduced into practice unless it has been properly tested and proved effective by research centers, preferably through a doubleblind, randomized controlled trial” (p. 188). In reality, he claims, much improvement occurs “on the fly” but always by paying attention to the results and trying to make them better. He argues for his medical colleagues to “measure ourselves”—to be more open and transparent about “what we are doing.” In the case of the highly effective cystic fibrosis centers, this means weekly meetings to review patient care, a vigilant, ongoing effort to consider multiple data sources in collaboration. I think immediately of the effort required to keep more than the required records in schools (which may or may not be measuring the “right” things)—the need for frequent opportunities to describe and document (i.e., make a record that others can access) student work and teachers’ work, the power of data that teachers collect to illuminate the subtleties of classroom interaction, and the many new questions that surface in communities of inquiry about assumptions, practices, and issues of equity in teaching and learning. Copyright © 2008 by the National Council of Teachers of English. Posted with permission. Lytle, Susan. 2008. 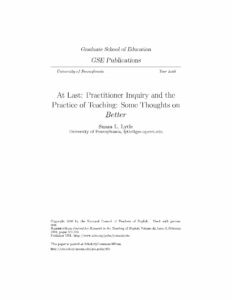 “Practitioner Inquiry and the Practice of Teaching: Some Thoughts on ‘Better’.” Research in the Teaching of English 42 (3): 373—379.